Today I found this set...and simply had to bring it home... it is a real gem, IMHO!!! 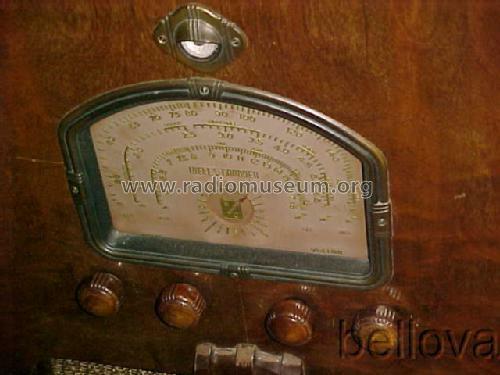 ... A Wells Gardner 11 tube OEL series radio. All metal tubes, with a super cool red dial and amazing huge escutcheon and tuning eye. I just got it home, so I will be checking it out really well. It appears it has a very special tuning dial, as there is no visible pointer... it must light up from behind. The dial is in perfect shape. The cabinet has the rounded top, which is real striking. I know this same radio was made by Lafayette... and it seems this set has not gotten the "respect" it may deserve here. Perhaps because they are simply not found often. Very nice find! A really impressive deco console. That bold arched top and large dial are nice touches. Enjoy. Those knobs look like RCA knobs. Here's a photo of what I believe the original knobs should look like. Model 7LL 8 tube set. This label also indicates it to be a "high fidelity" set... wow... cannot wait to get it all done and fire it up... 11 tubes, twin 6l6 outputs..should sound good!! I agree about the knobs...but this set may not have THOSE you posted.... when you google images of wells gardner consoles, all sorts of knobs show up on similar sets. My first radio in 1971 was a wells gardner table set, a 5K... it is a chassis only set..and i still have the wood knobs. 46 years later, i can finally re-purpose them..lol gotta dig em out!! Below is a picture of my restored Wells Gardner Model A1-MB (8 tube plus a tuning eye). The picture has had a superimposed watermark of "radioterry" added to discourage unauthorized copying. Very nice set!! I too, have a weak spot for 1930's Wells Gardner built radios. They seemed to be willing to fight the style norms of the day, on many of their sets.. I see them.. they appear disconnected...I have to look carefully in there when I get some time..and my magnifier..lol... stranger things have happened, but i cannot see someone swapping all the others and not those. I agree it would be strange not to have changed those out. I would have pulled the old ones out myself to have more room to work in. To each his own. There are some who will leave paper caps in low voltage circuits such as cathode bypass or AVC where the voltages never rise above 10-20 VDC. Some people don't like that, but hey, its personal choice. Very cool cabinet. I like that style. The beam if light dial system is very similar to the Deforest Crosley I just worked on.. They are a very unique system but quite simple. I would also change the rest of the capacitors if it was mine. That radio should turn out very good when you get it all finished..
Hey Midwest guys...this one is for sale in the Milwaukee area on C/L... I would love to have it.... different cabinet, glass dial face has green letters instead of the gold on mine. Likely the same OEL 11 tube chassis. There simply are no pictures of these sets online in any quantity, and very little written either. I Think they have a VERY well made chassis, look amazing... and yet very little known. Here is the chassis powered up... all good. Old caps are inert. You can see the way the dial is backlit....so very cool. It switches to each band too.. Looks better at night, with the other lights reflecting the red.... Got lucky also with a perfect NOS testing tuning eye. Is this the same one discussed here before?